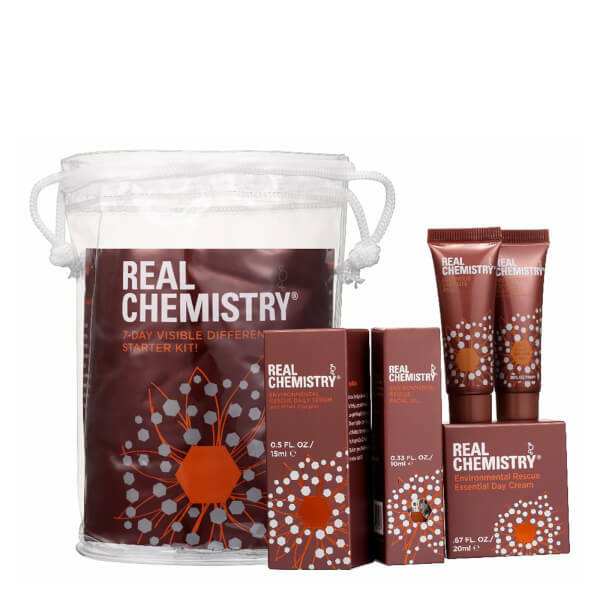 Real Chemistry 7 Day Visible Difference Starter Kit! 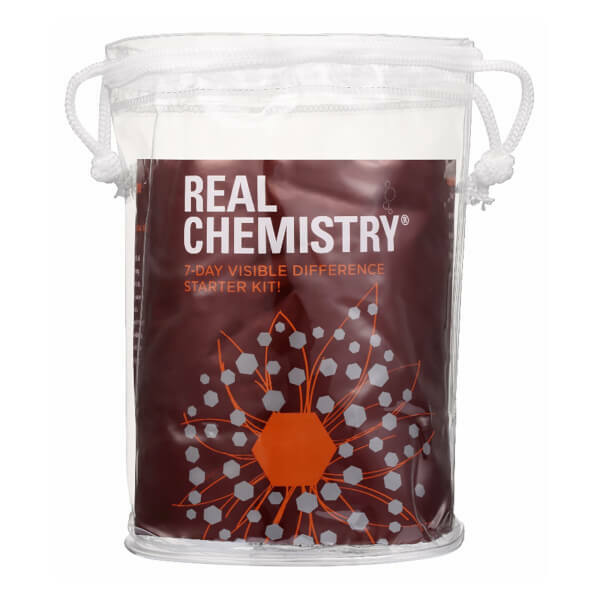 The Real Chemistry 7 Day Visible Difference Starter Kit! combines everything you need to improve the appearance of skin in just one week. Carefully curated, it provides a comprehensive daily skincare regime to leave skin feeling smooth, clean and refined. Arrives with a clear travel pouch. An exfoliating face peel that expertly removes dead skin to reveal a soft and renewed complexion. Its blend of ingredients work into skin, activating and combining with natural proteins to help lift away dead skin and reveal a brighter, more illuminated face and neck. The non-irritating peel leaves skin feeling soft, radiant and resurfaced after just one use. A revitalising cleanser that lifts away makeup, oil and impurities to leave skin feeling fresh and revived. Infused with a host of hydrating ingredients and deep cleansing Amino Acids, the cleanser expertly refreshes and moisturises skin whilst imparting a natural Grapefruit fragrance to invigorate the senses. Expect a smooth and soft complexion. An antioxidant-rich formula that eases discomfort and damage. Powered by the brand’s MTHV® Complex to strengthen the barrier function against UV rays, pollution and external aggressors, the silky serum also uses Aloe to soothe feelings of irritation and redness. Skin is left feeling calm, hydrated and visibly healthy. 100% cold-pressed Camellia Oil. Bursting with vitamins, omegas and Oleic Acid, the formula absorbs quickly to deliver improved protection against UV rays, pollution and other external stressors. The silky-smooth oil replenishes vital hydration and nutrients to create a soft, radiant and youthful appearance. A rich moisturiser that delivers up to 12 hours of hydration. The weightless, silky formula melts in quickly to release high moisture levels and antioxidant protection, helping to defend skin against the ageing effects of external aggressors. After use, skin feels soft and supple and is infused with a healthy and radiant glow. Peel: This is not a mask. The peel is a clear gel. Spread pea-sized amounts of peel over your forehead, cheeks, chin, neck, and décolleté. This takes approximately 20-30 seconds. Remember to spread the peel thinly over the skin. Immediately begin massaging the entire area in a circular motion. Apply light to medium pressure to ensure proper contact, but do not 'rub' your skin. Within 15-20 seconds, solids should form under the fingertips. This means the peel is activating correctly and is now combining with your dead skin (proteins). The solids you feel are a combination of the peel and the epidermal tissue. The peel is applied as a gel and removed as small solids, after having combined with the dead tissue. Massage for 2-3 minutes to ensure that all of the product has combined with as much dead skin as possible and that no peel has been wasted. Cleanser: Dispense a coin-sized amount of cleanser onto fingertips and gently work into a foamy lather. Massage over the face in light circular motions. Gentle enough to use on eye lids and under eyes. Keep out of eyes and avoid ingestion into nose and mouth. Rinse with cool or warm water. Repeat morning and night. Recommended for use before and after using the Luminous 3 Minute Peel. Serum: Day and night, apply thin layer across entire face and neck using 2-3 drops and before any other products are applied. For day, use under sunscreen and cosmetics. At night, use under night cream or oil. Oil: Day and night, apply two to three drops of oil in your hands, rub them together and apply to clean, dry skin on the face and neck. Day Cream: Mornings, apply evenly across face and neck after applying the Environmental Rescue Daily Serum and before makeup. Peel: Aqua ( Water), Glycerin, Peg 5 Glyceryl Triisostearate, Alkyl(C=10-14)Benzyl Trimethyl Ammonium Chloride, Carbomer, Hyaluroinc Acid, Disodium EDTA, PEG 40 Hydrogenated Castor Oil PCA Isosteaerate, DMDM Hydantoin, Iodopropynyl Butylcarbamate, Diazolidinyl Urea. Cleanser: Aqua, Sodium Lauroyl Sodium Chloride, Oat Extracts, Glycerin, Sodium Laureth Sulfate, Glycol Disterate, Beeswax, Glyceryl Stearate, PEG-100 Stearate, Sodium Chloride, Potassium Hydroxide, Hydroxyethyl Cellulose, PEG-150 Disterate, Diazolidnyl Urea, Iodopropynyl Butylcarbamate. Serum: Aqua, Butylene Glycol, Hydroxyethyl Urea, Saccharum Officinarum (Sugar Cane) Extract, Glycerin, Betaine, Propylene Glycol, Laurocapram, Alpha Arbutin, Phenoxyethanol, Hydroxyethyl Cellulose, Hydrogenated Castor Oil, Polyglutamic Acid, Hyaluronic Acid, Menthol, Glutathione, Metallothionein (MT), Recombinant Hirudin (HV2), Fragrance. Oil: 100% Cold Pressed Camellia Oil. Day Cream: Deionized Water, Glycerin, PDMS (Polydimethylsiloxane), PEG-100 Glyceryl Stearate, Cetearyl Alcohol, Hydrogenated Polydecene, Caprylic/Capric Triglyceride, Tocopherol (Vitamin E), Lanolin, Butyrospermum Parkii.